Tennessee - After what seemed like an eternity but what was in fact a mere 22 days, the winner of the largest jackpot in Tennessee Lottery history came forward today to claim his $259.8 million Powerball prize won from the drawing held June 11. Amid TV cameras and cheers from an enthusiastic crowd of well-wishers at Lottery headquarters in Nashville, Knoxville Roy Cockrum, 58, stood for pictures with Lottery President and CEO Rebecca Hargrove and the traditional oversized winner's "check" after presenting his winning ticket earlier to Lottery officials. Floria - The Florida Lottery announces that the FlaMass Family Lottery Joint Venture claimed the $148.8 million jackpot prize for the POWERBALL® drawing held on Wednesday, April 23, 2014. 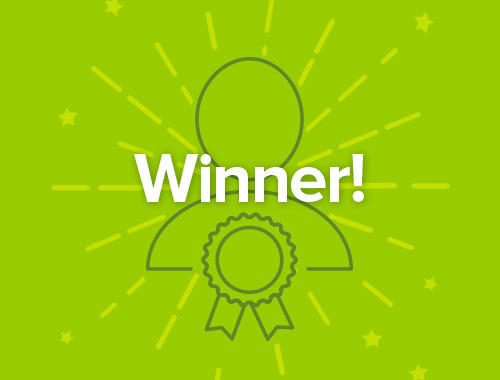 The partners of the joint venture, Louis Centrella, 72, of Daytona Beach; Suzanne Centrella, 54, of Naples; and Christopher Centrella, 39, of Naples; chose to receive the winnings as a one-time, lump-sum payment of $86,932,220.04. Missouri - A St. Charles man and his wife are living the dream that they "never in a gazillion years" expected to have, after they discovered their Powerball ticket from March 22 was worth $96.5 million. John Brands said he checked his Missouri Lottery tickets with the numbers on the Lottery's website the morning after the drawing, before heading out to play golf. When all six numbers matched, he went to wake his wife, Susan. "I thought the house was on fire," she said. "I thought he was messing with me." California - For some people, winning $60 million would be life-changing. For Joseph Saxer, the winner of the March 1st Powerball jackpot, it's not going to change a thing. And if you have any doubts to that claim, wait until you hear how Saxer celebrated the big win. "I took my wife to Carl's Jr. and we got a buy one get one free of the, what they call the 'Philly Cheese,' and we shared a Coke then went back home," said Saxer, an Air Force retiree. Need even more proof? When asked if the couple would now start buying two Cokes, Saxer just laughed. California - After waiting nearly a month and a half, we finally have a winner! No, this isn't an April Fools' Day joke, but B. Raymond Buxton does have quite the sense of humor. 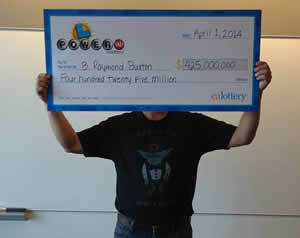 He purposely chose today, April 1st, to come forward and claim his massive $425.3 million Powerball jackpot prize and he did it while wearing a shirt that featured a picture of Yoda and read "Luck of the Jedi I have." Buxton claimed his prize at the California Lottery headquarters in Sacramento and took a little time to share some of his story. Missouri - A Kansas City couple undoubtedly had their best Christmas ever after finding out they won the $71.5 million Powerball jackpot, the sixth-largest Lottery prize ever sold in Missouri. 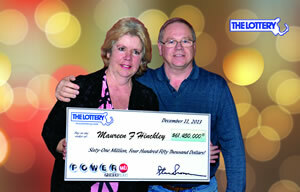 Kevin Carlson, 49, and his wife claimed the prize at the Lottery's Jefferson City headquarters on Dec. 26. Carlson also celebrated his birthday on Dec. 27, one day after discovering the win. Carlson, a mechanic, said he bought Missouri Lottery tickets often when he made his usual stop at Autobahn BP, 7538 N.W. Prairie View Road in Platte Woods. Nebraska - Today, Gov. 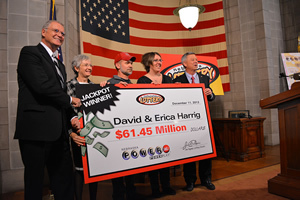 Dave Heineman presented David and Erica Harrig of Gretna a temporary award check for $61.45 million dollars from the Nebraska Lottery Powerball jackpot. 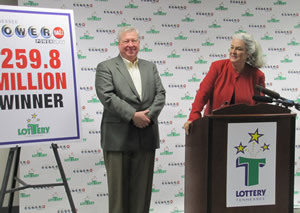 The Gretna couple had one of two winning tickets in the nation for last week's $122.9 million Powerball jackpot. "Christmas came early for the Harrig family," said Gov. Heineman. "I am very happy for David and Erica, and I wish them all the best this holiday season." Massachusetts - A Sterling, Massachusetts couple has 61.4 million reasons to celebrate the New Year after stepping forward today and claiming their share of a $122.9 million lottery jackpot won in December. 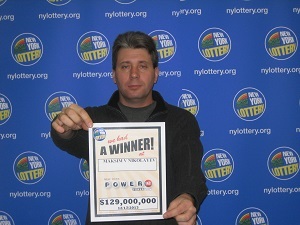 New York - Maksim Nikolayev of Brooklyn has claimed a $130,300,000 New York Lottery jackpot prize from the November 16, 2013 Powerball drawing. Nikolayev is a regular player of the New York Lottery's jackpot games. He plays twice a week regardless of the size of the jackpot. Nikolayev purchased his jackpot winning ticket on Thursday, November 14, 2013. The store he usually buys his tickets was closed, so he decided to go to the Brighton Beach Bakery Deli at 117 Brighton Beach Avenue in Brooklyn instead. California - Carlo "Carl" Mitchell is a calm man – a VERY calm man. So calm, in fact, that even after he found out someone won the Powerball jackpot from where he buys his tickets, he stayed calm. And even after he saw three of his Powerball numbers flash on the television screen during the news, he stayed calm.